It’s the month of love again! To ensure that you and your significant other have the best day, here are some amazing offers you can enjoy. Celebrate your love for another in an aesthetic and historical landmark, as Mount Lavinia Hotel has four unbelievable offers for couples. This includes a welcome cocktail, six-course set menu, and free entrance to The Hut. Experience a romantic dinner with the sand under your feet, stars above, and the sea beside you in your very own love hut on the beach. This includes a welcome cocktail, three-course set menu, and free entrance to The Hut. Serenade your valentine amidst the grandeur of a romantic setting! 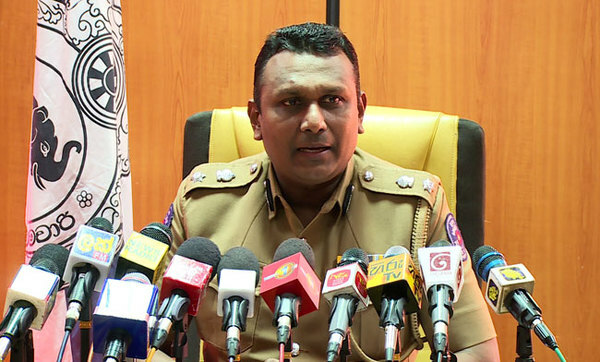 An exclusive deal on 14 February, 2019 only. Commercial Bank 20% discount on above events on tickets/buffets/food only. For reservations call 0112 711 711 Ext: 430 or 0772 366 445 or e-mail events@mountlaviniahotel.com. Serenade your partner with a five-course dining experience like no other . Contact Royston on 0772 366 445 to bid and for further information or reservations call 0112 711 711 Ext: 430 | 0772 366 445 or e-mail events@mountlaviniahotel.com. Enjoy an international dinner buffet including carvery and action stations, which also includes an extended dessert counter for your indulgence. A romantic Valentine’s dinner with a fine dining experience. Valentine’s treats including homemade goodies, cupcakes, chocolates, and specialty cakes and cookies. Dine on a boat with an exclusive Valentine’s dinner cruise featuring cocktails, bubbly, and a seven-course dinner menu with individual butler service. Exclusive to 14 couples only. Ever dream of a buffet made completely out of chocolate? Well, dreams do come true as you can enjoy a pure chocolate buffet this Valentine’s Day. Cute treats in the form of strawberries and cream, heart-shaped and cupid cakes, heart-mallows, chocolates, and much more await you. Enjoy an international dinner buffet which will feature some of the best food from around the world. 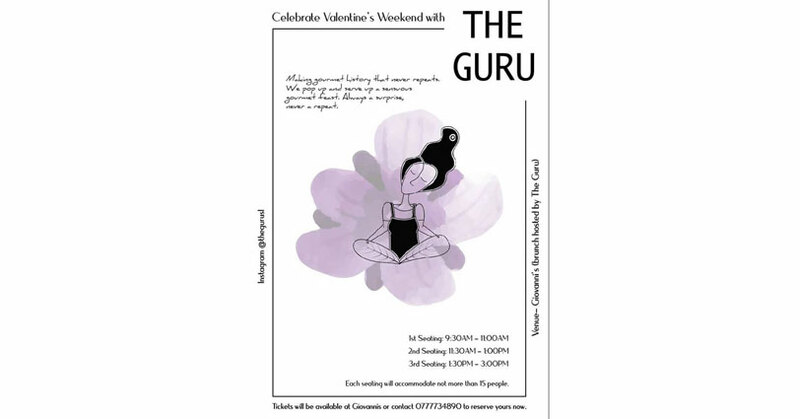 Celebrate with your special someone, with beverages, tapas, and cupcakes. Celebrate love at another iconic hotel as they bring you offers you can’t afford to miss! A historic venue and music to serenade your soul featuring Thanuja Perera. A magnificent sunset to gaze on and a loved one to impress, our pool terrace is the most picturesque with the best view in the city! Enjoy a private dinner amidst the stars. 6. 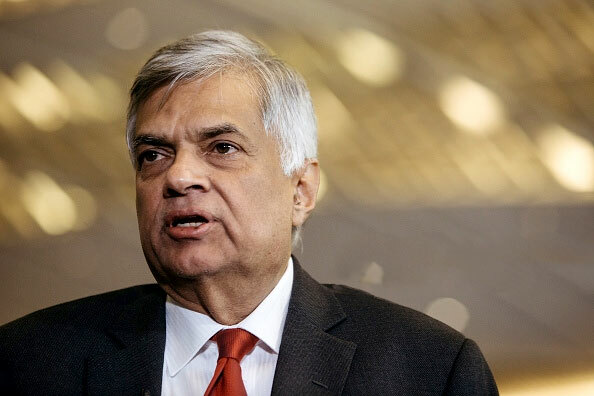 Hilton Colombo has lots in store! Indulge in a range of specially handcrafted cakes, chocolates, and desserts all week long. 1-14 February 10 a.m.-10 p.m. Gift your significant other, friend, or family member a beautiful bouquet of flowers or bring along your gift for a unique gift wrapping experience. Say hello to Hilton’s very own Valentine’s mascot and get a complimentary love cookie for all lovebirds who walk in during lunch and dinner. Spot the heart and don’t forget to take a picture with the mascot under #LoveatHiltonColombo and stand a chance to win exciting prizes. 12 p.m.-2.30 p.m. and 7 p.m.-9 p.m. 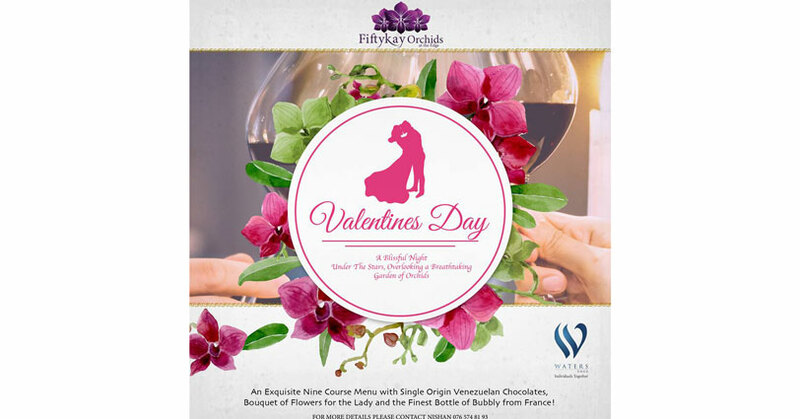 Enjoy a five-course meal accompanied with a rose and specialty chocolate for your lovely lady and music to keep you entertained all night long. This is especially catered to couples who love the finer things in life. Enjoy a five-course meal in your own cabana accompanied with sparkling wine, strawberries and cream, chocolate, a love card, and a rose for the lady. 50% off for couples over 55 years old. It’s never too old to celebrate love! Enjoy cuisine from around the world. This is perfect for those insta-couples who love travelling and experiencing a bit of everything. Enjoy a five-course set menu including a starter, soup, two main courses, and dessert complimented with wine. Enjoy a rooftop party with a beautiful view of Colombo as you celebrate with your loved one. Choose from an outdoor lawn and marquee, the Horizon Club Terrace, or the Shangri-La suite and enjoy a dinner for two with a private chef and waiter, a bottle of champagne, roses, and much more. Reservations must be made 48 hours prior. Indulge in a four-course sensory menu whilst enjoying the music of Bebop and the Barking Crickets. Enjoy romance-inspired cocktails from 7-15 February, courtesy of their mixologist Alex. Enjoy an exquisite global cuisine dinner buffet for Rs. 4,100 Nett per person at a luxurious restaurant. Enjoy extended happy hours from 3 p.m. to 8 p.m. Buy one and the second is free. 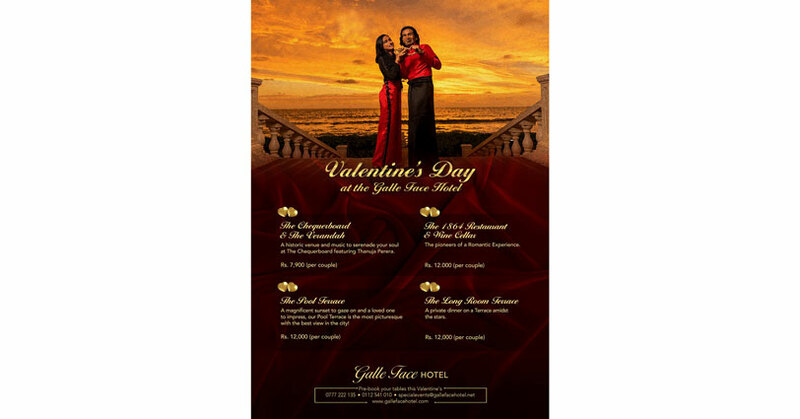 Valentine’s Day special celebration with live music and especially selected seafood set menu. 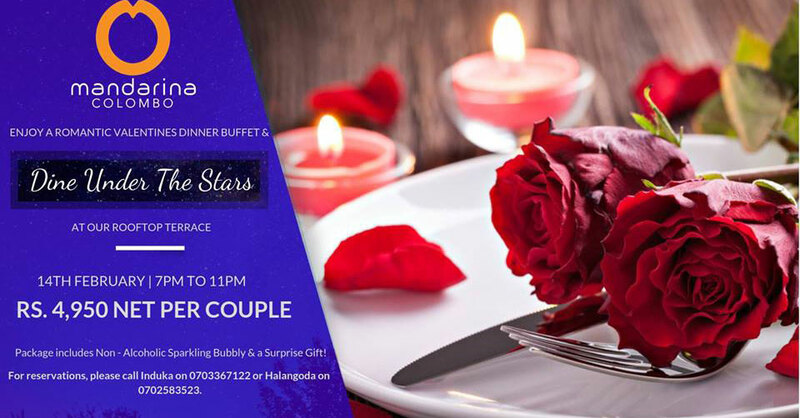 Valentine’s eve dinner by Marino Food Emporium in partnership with Diliganz, Ximi Vogue Sri Lanka, Sri Saravanas Privilege Hub, and Sayonara Jewellers. Enjoy a romantic Valentine’s dinner buffet and dine under the stars at their rooftop terrace. 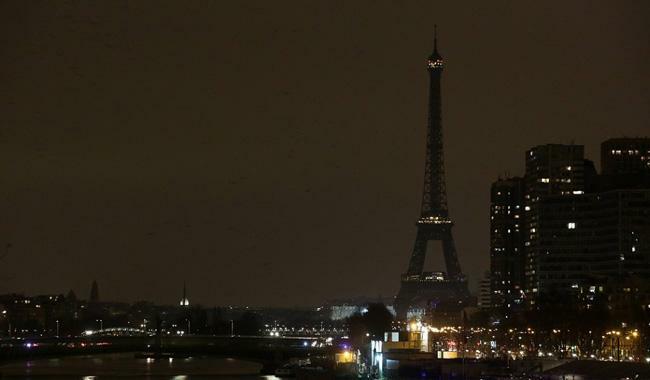 14 February, 7 p.m.-11 p.m. The package includes non-alcoholic sparkling bubbly and a surprise gift. A Valentine’s Day party from 7 p.m. until late on 14 February. Enjoy special drinks all night and dance to the beats of DJ Ricky and DJ Pradeep. First seating: 9.30 a.m.-11 a.m.
Second seating: 11.30 a.m. to 1 p.m.
Third seating: 1.30 p.m. to 3 p.m. Please note that due to limited seating, tickets are sold prior to the event. Tickets are available at Giovanni’s or DM to reserve yours now by contacting 0777 734 890 for more information. Make your reservations for FLOW’s Valentines dinner buffet on or before 10 February, 2019 and stand a chance to win a 60-minute massage therapy treatment. Enjoy an international buffet, live entertainment, and a glass of sparkling on arrival for Rs. 3,900 Nett per person. 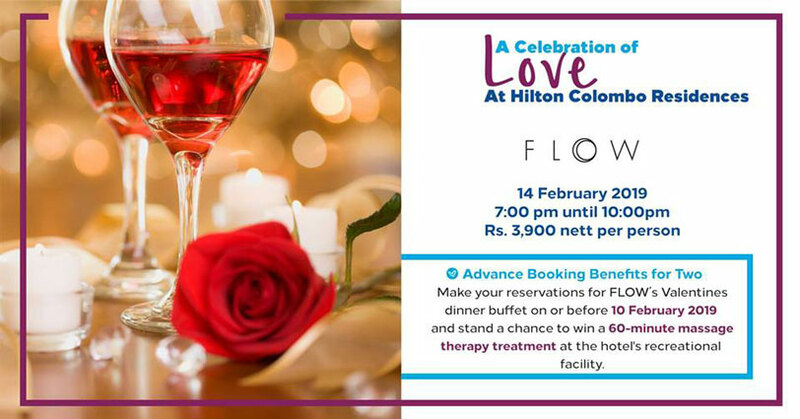 Visit www.flow.lk/valentines-day for full details and conditions. 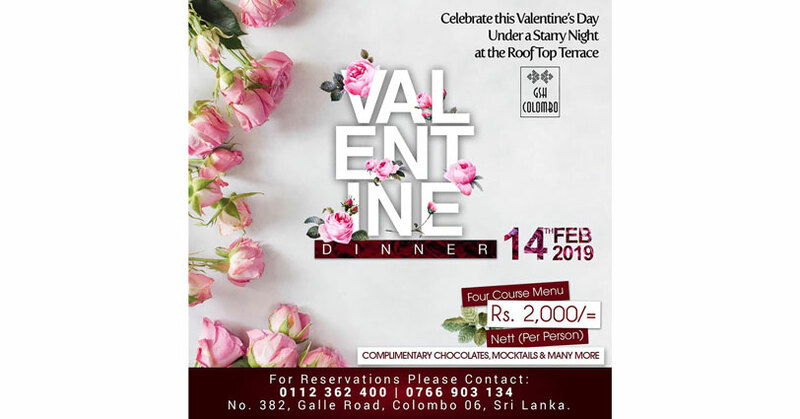 For the respect of love, great times, and memories, GSH Colombo presents Valentine’s dinner because your special one deserves special treatment on this special day! A blissful night surrounded by a garden of orchids awaits you at Waters Edge. The Fiftykay Orchids luxury fine dining restaurant is ready to offer you an exquisite nine-course menu, your own butler, exclusive musicians to sing love songs throughout the night, a bouquet of flowers for the lady, single origin Venezuelan chocolates, and the finest bottle of bubbly from France. 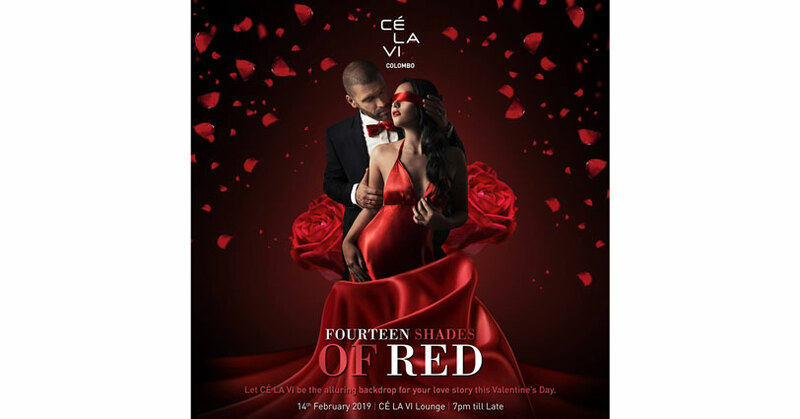 Experience an intimate escapade with your lover at the CÉ LA VI Lounge on 14 February from 7 p.m. till late. Be seduced by the stars above you and enjoy their deliciously decadent cocktails and the music that’s sure to hold your senses hostage. Soulful vocals and music strictly on vinyl will be performed by the talented vocalist April Schokman and DJs Tareeq and Tim. Celebrate Valentine’s Day with your loved one on an ideal romantic getaway. 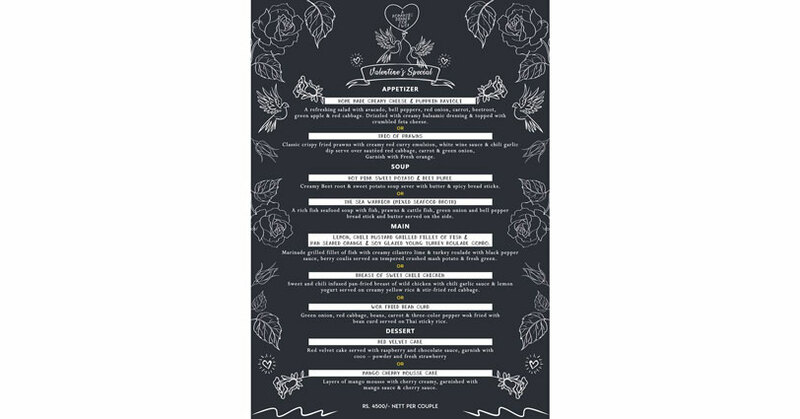 The rate includes candle-lit dinner, a romantic setting, a la carte five-course meal, and other terms and conditions apply. 14 February, 7 p.m. onwards. Enjoy wellness treatments, bird watching, wildlife spotting, jet-skiing, tubing, and other thrilling activities during your stay. Take in the surrounding views as you watch a dramatic island sunset while gliding along the largest freshwater lake on the island. Enjoy a romantic view with spectacular food and a chance to win some amazing prizes. Why not spend Valentine’s Day at the heart of Colombo? 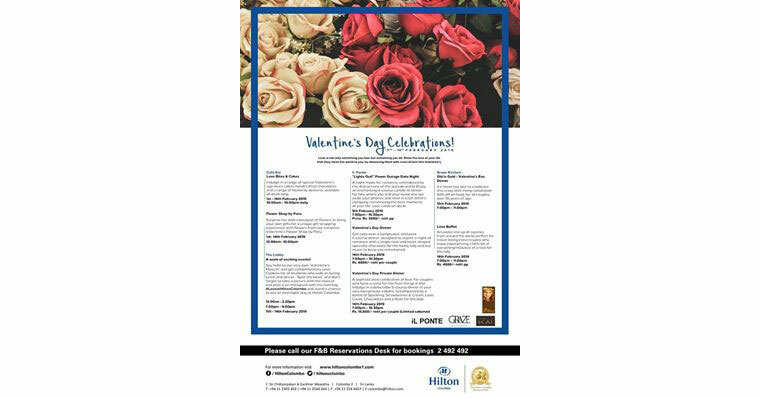 Complimentary roses/heart-shaped chocolates, photograph on request, and beverage promotion. This also includes competitions for the best dressed couple, the first couple on the floor, the best dance couple, and a live band. The best dance couple will get an overnight night stay voucher. 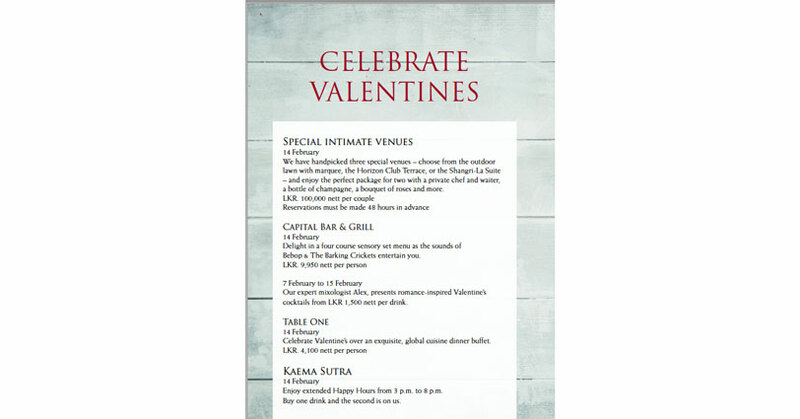 Enjoy a specially curated scrumptious menu for two this Valentine’s Day. This includes a four-course menu along with a range of choices in each course. Contact them on Facebook or Instagram for more details. Lankan born, Geshany Balder is a full-time and fully fledged artist who believes in expressing her art to the public. 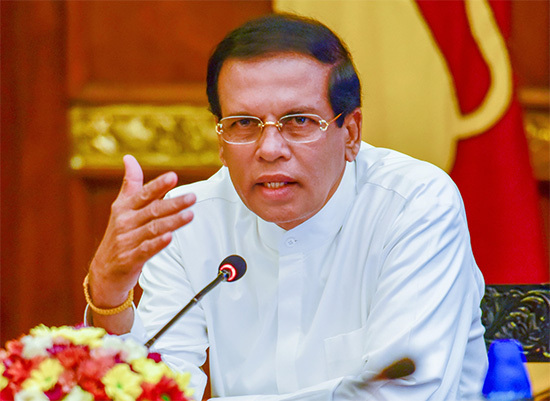 “Art for Rights”, the South Asia Human Rights festival organised by Amnesty International South Asia, was held at the national film corporation, Colombo from 5-9 December.